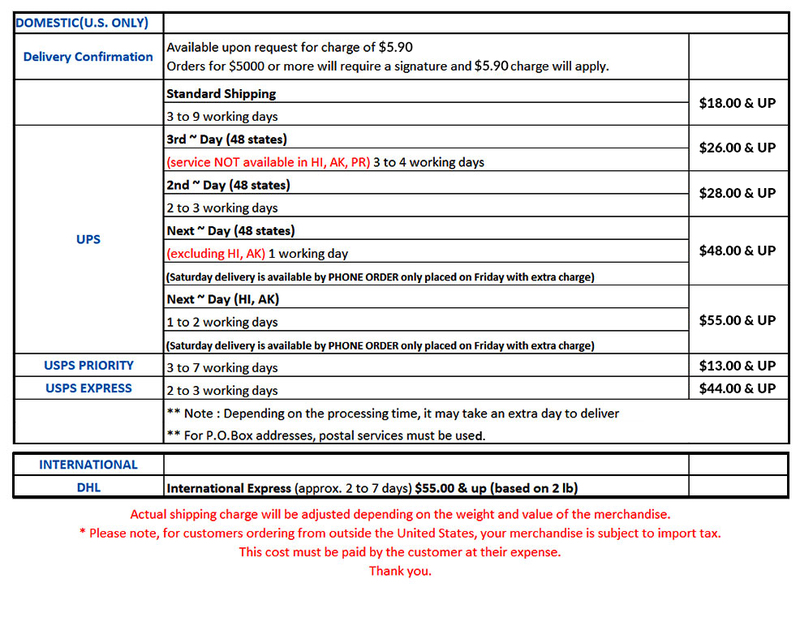 For security reasons, all first time credit card orders must be shipped to the billing address. If you are a first time customer and need to have your order shipped to an alternate shipping address, you may pay by Payal. After placing your order, if you need to cancel your order, please call our office within 1 hour after placing your order before 2 pm pst. If you have placed your order during off hours, please call us as soon as we open. Sorry, once the order is shipped, we cannot cancel the order. Shipping delays may occur due to holidays, natural disasters, or carrier delays. If a guaranteed delivery is delayed due to weather or other natural disasters, there will be no guarantee. Since no one has control over natural causes, shipping charge will not be reimbursed. Please keep in mind holidays do not count as a business day and should be considered when calculating shipping times. Shipping refunds on delayed ordered due to carrier delays will be issued as in-store credit only. We can only offer credits on orders shipped through UPS. USPS Priority is not guaranteed. If you want to claim shipping credit for UPS, then please call us after you have received your package. UPS requires the package be delivered first before they can issue the credit. If you are returning any orders that have received Free UPS Ground shipping, then a flat shipping fee of $10.00 will be deducted before the refund is issued. For any shipments returned to us due to a bad address, refusal upon delivery, or cancellation, there will be an additional shipping and handling charge of 10% of your order total (50% on international orders). Shipping and handling charges are non refundable.